Multiple teenagers declared dead after Italian nightclub stampede. Multiple teens and an ADUlt are dead after nightclub stampede! A police statement said that five teenagers and a woman were killed at an overcrowded rap concert in Corinaldo, Italy early Saturday morning (around 00:00 GMT). 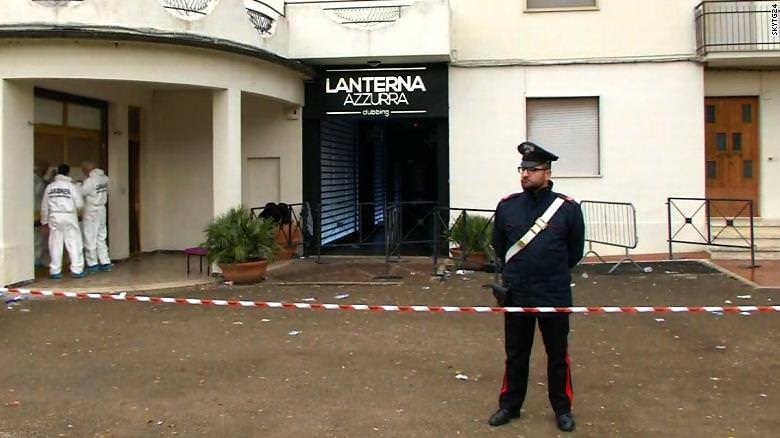 The incident happened in the Lanterna Azzurra (Blue Lantern) disco in Corinaldo (a town on the central Adriatic coast). Of the teens killed, the ages range from 14 to 16 and a 39-year-old woman who had taken her 8-year-old daughter to the concert. out of the 100+ people injured, 13 people are currently seriously injured. It is reported that people panicked after an "irritant substance" was sprayed into the crowd. The people started running for the exits of the nightclub which was designed to host up to around 870 people. The chief prosecutor, Monica Garulli, told reporters at the scene that around 1,400 tickets were sold. Local reports state that around 1,000 people were in the nightclub at the time. A witness statement claims that "we ran to one of the emergency exits but we found it blocked, the bouncers told us to go back". Although the investigators appear to "knock down" the possibility that the emergency exits had been blocked. A surviving teen stated: "We were dancing and waiting for the concert to start when we smelt this pungent odour". The Italian rapper (Sfera Ebbasta) said that he was "deeply sorry" and that the victims' families had his "love and support". He added "I don't want to pass judgement on those responsible for this, but I'd like everybody to pause and think about how dangerous and stupid it can be to use pepper spray in a disco." suggesting that pepper spray was the irritant substance people described. Italy's Interior Minister, Matteo Salvini, stated that the possible "stink" could have been ammonia or some other unknown substance. He also said that there were probably "more people inside than permissible". and that "people cannot die like this". There is an ongoing investigation into the event and whether the incident could have been avoidable. Do you think the incident could have been avoidable? Let us know in the comments down below!